Ultimately, he realizes that he will. I Am Barack Obama highlights for children their personal power to change the world. In the backmatter, children share stories of the possibilities for their lives, as they aspire to the greatness they have seen in Barack. ›	Renowned critic Kam Williams lauds I Am Barack Obama’s uplifting narration, beautiful illustrations and inspirational message. June 2009. Read here. ›	Website, Literary Obama, applauds Carney-Nunes’s innovative strategy in presenting I Am Barack Obama. July 2009. Read here. 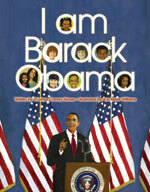 ›	The Brown Bookshelf talks to Carney-Nunes about I Am Barack Obama and her other children’s books. September 2009. Read here.